New and unique species that are found in abundance in the Sulawesi Sea. As well as squid, but not the animals which had to be tentacles. Similar worms, but neither. Over time the scientists are in agreement "Squid worm also known as the animal called" worm of the squid. The mention that the worm is not only for the way the squid, but also by the nature. However, the scientific name is Teuthidodrilus samae. 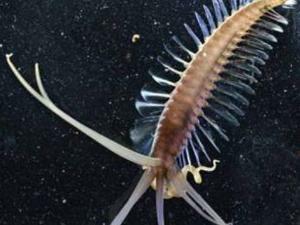 Unique animal was found by scientists from the Woods Hole Oceanographic Institute and the University of California, Santa Cruz. The location is in the Sulawesi Sea. This species is highly suspected of acting as a missing link between the species that live in the soil of mud from the sea and life only in the water column. Scientists use remote control cruise in the basin at a depth of 2,800 to 2,900 meters between Indonesia and the Philippines. Or it is just 100 metres from the bottom of the Sulawesi Sea. Santa Cruz, marine biologist, Karen Osborne said the squid was the transition from the worm body color from Brown to black. Increased muscle under the skin of bright pink used for bathing. "This is a transitional species between benthic ancestors - living in the mud at the bottom of the sea - and other species that live in the water column that never went to the bottom of the sea," said Osborn, such as sites loaded MSNBC, Wednesday, November 24, 2010. Studying the new species is expected to help collect historical evolution and determine their characteristics. Added Osborn, the Sulawesi Sea basin is surrounded by a moat. This is to prevent mixing of species at a depth of 1,500 meters. "It's really in and isolated from water in it," he said. There is little exploration done in the sea. The presence of new species, squid worm proved, there is much that remains a mystery on the seabed. "This discovery shows how much we know not there yet." Think of other interesting things that can be located on the seabed.